Make sure you and your loved ones can get home when stranded. 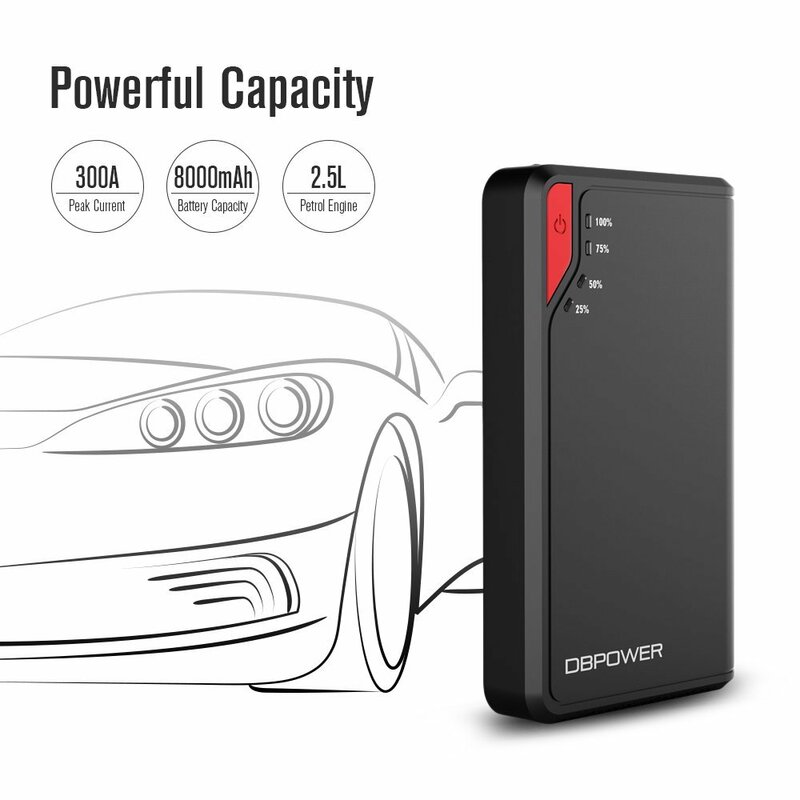 This will jump start your 2.5L gas engine up to 10 times on a single charge. 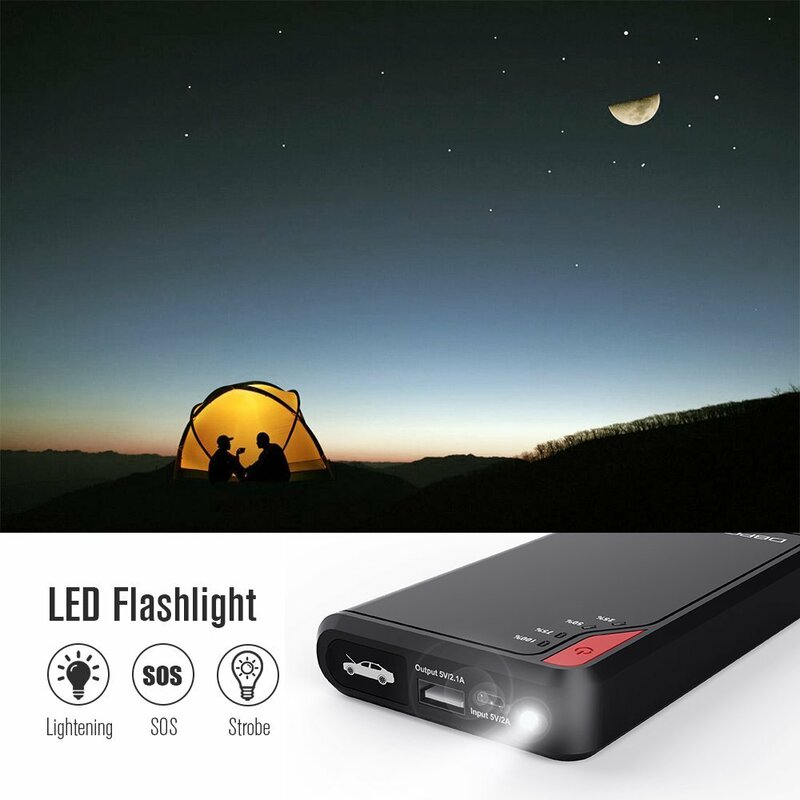 It has 3 modes LED light (high, strobe and SOS), It’s an emergency life saver when you go camping , picnic, outdoor adventure or investigation. The rugged appearance of bold color. Blue power LED indicator flashed on the surface, make it looks so cool. 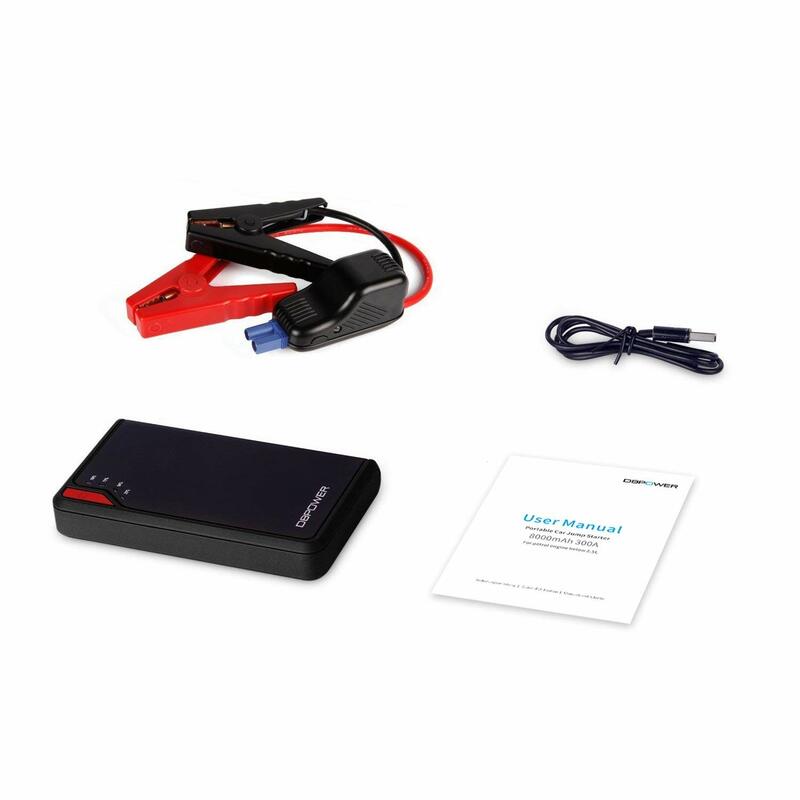 Unlike traditional bulky jump starter packs, it’s small enough to store in your glovebox and light enough to pack in your bag. Slim enough to charge your device as a power bank. Small enough to hold as an iPhone 6. It charges cellphones, tablets, kindles, anything with a USB port and then some. 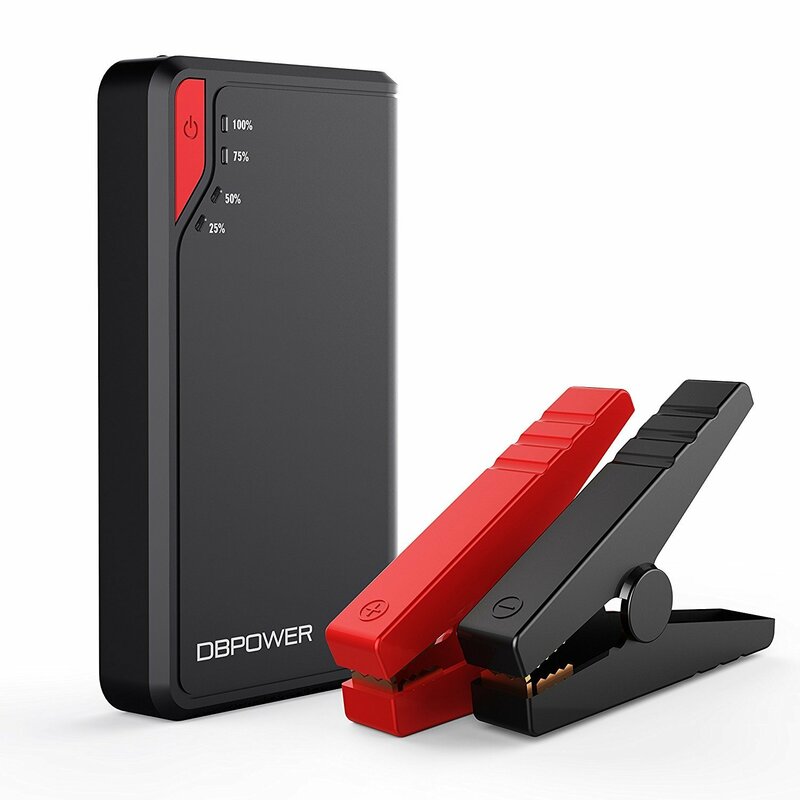 Charge your device together anywhere anytime. 1. ONLY COMPATIBLE WITH GAS ENGINE UNDER 2.5L. 2. Don’t crank the engine for more than 4 seconds. Allow the jump starter to cool down for at least 30 seconds to 1 minute after each start. 3. 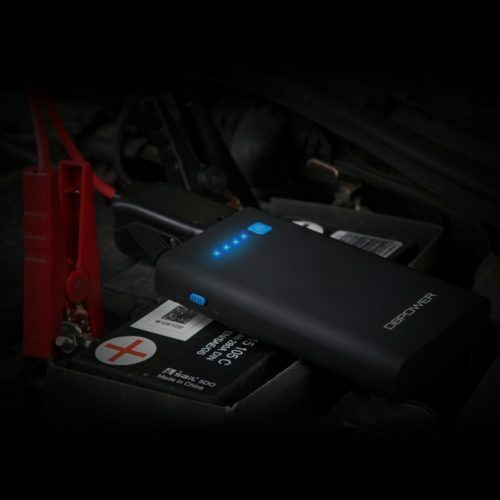 The jump starter will perform best when it is fully charged. If less than 25% charged, it may not be able to start your engine. 4. 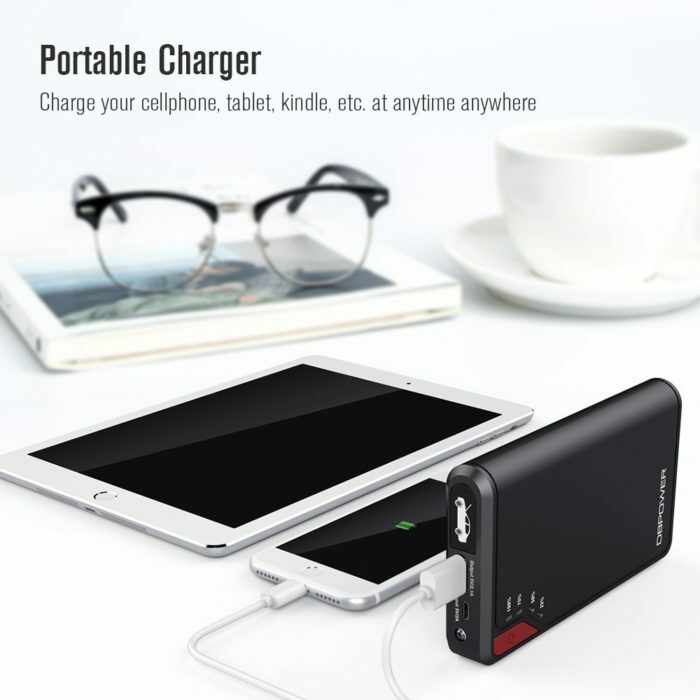 It is highly recommend charging the item with a 5V AC power adapter or wall charger plug to get the fastest charging speed. 5. Clearing up the dust on the electrodes of your car battery before jump starting. 6. Do not connect the positive and negative polarity together when it’s power on. Fantastic battery! Sort contact design and multiple uses! 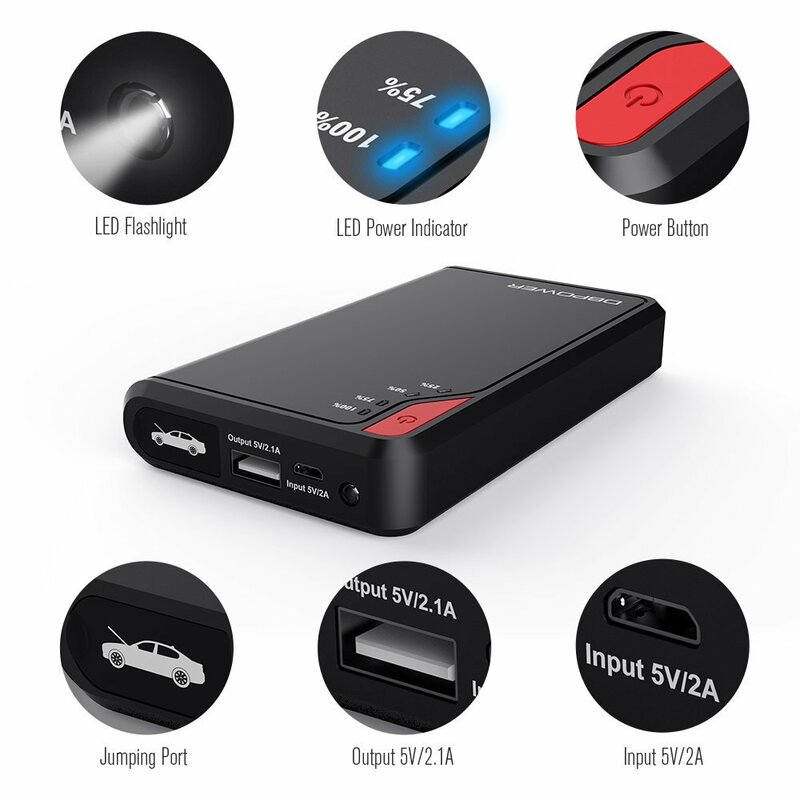 We love this little power pack! It jumps anything! I can not believe how small this jump starter is! The last one I owned was the size of a car battery and this unit is just slightly bigger than a portable hard drive. So far, I only had the need to use it once and it worked flawlessly. Great product! Highly recommended! Smaller than a traditional set of jumper cables. 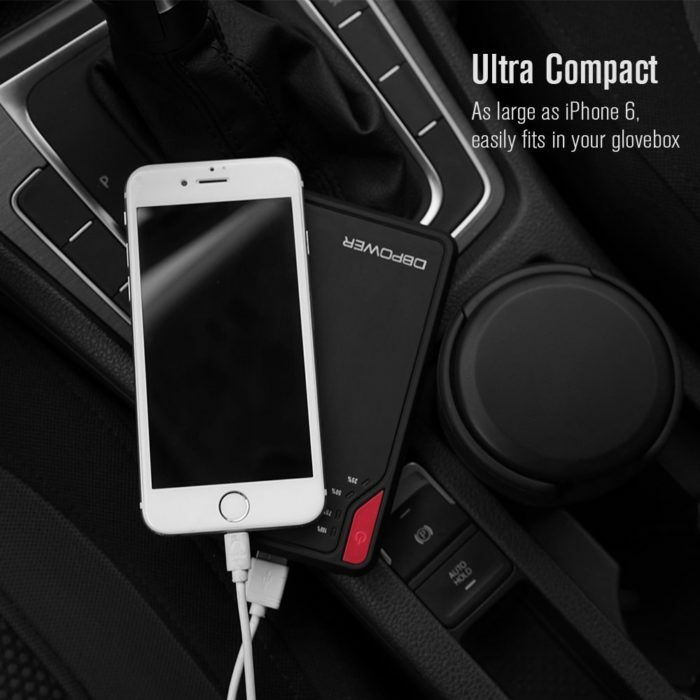 Very small – fits easily into glove box or under seat of the car. Smaller than a traditional pair of jumper cables. Haven’t had to use it yet (of course nobody ever wants to HAVE to use one of these) – but gives me piece of mind knowing it is in the car. I used to have a much larger jump-starter (the size of a large lunch pail). It was nice – but SO big. Must have for all cars! My dad bought this for me when I moved out for college and let me tell you this thing is a lifesaver. Since I was alone in a new city this thing came in hand last week when I accidentally left my lights on and my battery died! This thing worked like a charm and issues what so ever on my Honda. It even had enough juice to charge my phone so I can make have in case on an emergency. This thing also works as a back up battery pack for when you need that extra juice on the go. It fits easily and out of the way in the glove compartment. Highly recommend it!!! UPDATE: Company reached out and addressed the issue. Points for them for taking care of it. ORIGINAL REVIEW: Didn’t work. Capacity light came on once when I initially charged it but never came on again. Return process was easy enough through Prime. I love this product, very easy to used and it’s very important to carry one with you at all time. Good price for a great product. great for emergency use ! Works perfectly! Truly a time/money/lifesaver!! I had to use this 3 times to jump the battery and I am so happy I had it! It was so look easy and worked excellent. I used it 3 times and then put it back on the charger (though it still showed it had charge left) and used it again. I have recommended this to everyone I know and have used it on a friends car also. Well worth the investment considering how inconvenient and expensive just getting a jump could be.. Even a pair a decent jumper cables run the same price and you need another car or have to ask a stranger. This is wayyyy better! Great to have and easy to carry in my car to charge my phone when working at different events. I did have to use to the product to jump my car and it was easy! One of the best investments I made and kept me out of a jam. Great compact unit. Keep in glove box just in case. Charges with usb. Super compact. Charges via usb. Can’t believe it works. Jump started my lawn tractor (I know, not a big load) but the battery wasn’t low, it was dead. Measured 28mv on dvom. Had to hold button on jump start leads to force contact. Otherwise on a semi charged battery it is automatic. A Definite life save!! I was worried may battery would die at the wrong time, leaving me stranded. I don’t have to worry about that any more! 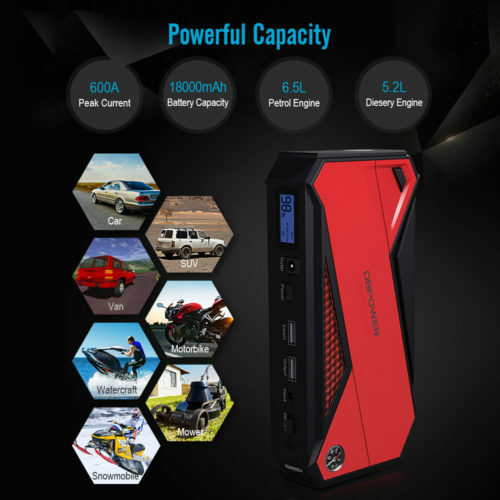 Very fast car battery and/or electronic charger! I bought this charger, because my car battery died and I didn’t want to have to call a tow truck for a boost to my battery. 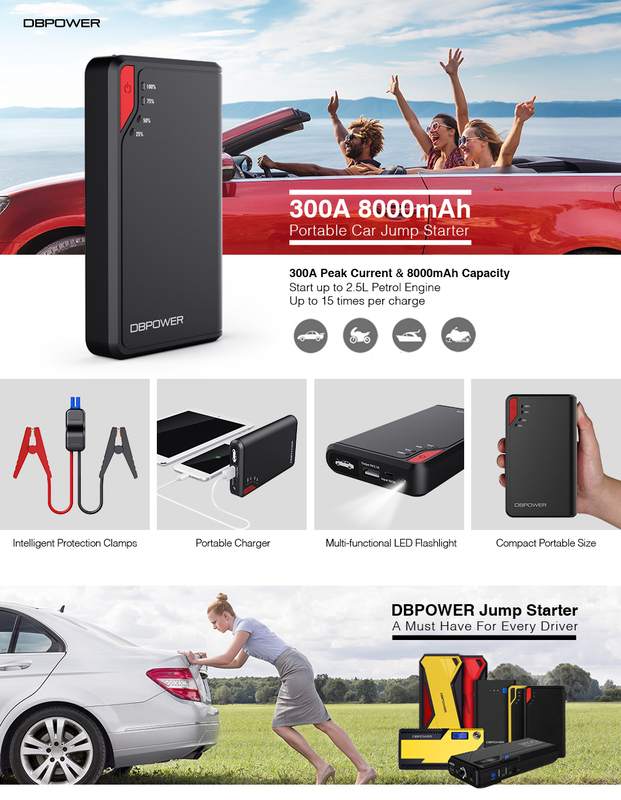 I had no idea that I could use a product like this DBPOWER charger to jump start my car. I did exactly what the instructions said, and I hooked this to my car battery and my car started. This only took about 3 minutes. I now carry this in my car so that I will not be stranded again! Glad I bought this item. It will save me from using a tow service in the future. Love how small and compact it is. We’ll see how it works when it is needed. It is easy and light weight. Perfect for emergencies and takes up minimum space. We have a survival bag and we put it in there as we take it everywhere. Had to use it yesterday for the first time. Was not disappointed. 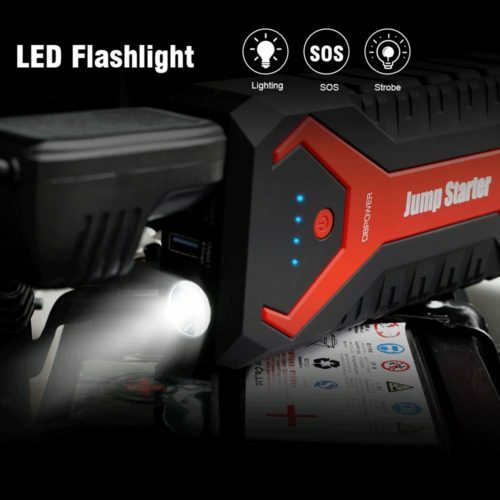 This jump starter is amazing. *Is powerful. *Is compact and easy to carry wherever you going. *Also has a USB spot to charge your phone. I highly recommend this product. Love how small and portable it is. No more getting stranded in the desert with a dead battery. We have not had to use it to actually jump start the car yet, but love traveling with it knowing that we could jump start the car ourselves if needed. We spend a lot of time camping in remote areas and it is nice to have the security. In the winter of last season, my car has run out of batteries. I borrowed a battery in my company and recovered it. Purchase for the next time the battery runs out. Although I have not used it yet, it is very small storage is not bothersome. Already saved me, left my car at the airport and when I arrived from a trip battery was dead. Hooked this up and started right up. Small and compact, very easy to use. 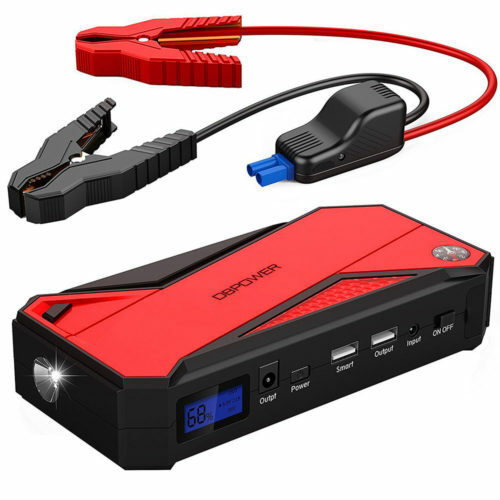 Has enough power to jumpstart a dead battery. Haven’t had the need to use the built in phone charger or flashlight but is nice to have in case of an emergenvcy. Great to have in your vehicle for whenever needed. Small and compact. Works! Excellent product works as described. I have used this starter multiple times due to my battery getting old and it works like a champ every time. I hook it up and start my car without hesitation. adds peace of mind when I’m riding my motorcycle, wish I would have had it before my last breakdown….. This is the second one I have gotten. I have one in my Mini and now one in my Scion Xb. I have used this to jump my bosses car and the fork lift at work. This is an amazing little charger and everyone should own one. It is a life saver. Needed it for my car since the battery has a parasitic drain and I have to constantly jump Having a portable jumper keeps me from having to worry about whether strangers are going to help me and makes feel more secure. I recommend it and would buy it again. Can’t stress enough how amazing this is. Admit I was skeptical as how can it charge my iPad AND my car battery. but it worked like a dream and I love the option in the event that it is needed. Not totally comfortable yet to keep it in my car in this Arizona heat but definitely will keep it in my car as a just in case when it cools down a little. Carry this with your motorcycle! This charger is fantastic! 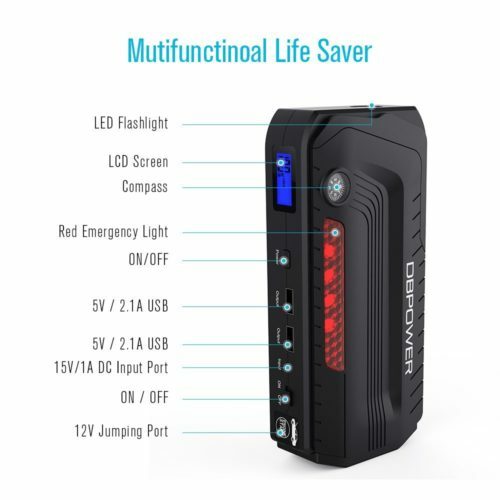 I like to carry it on my motorcycle to charge my phone and standalone GPS without having to modify anything on my bike and the added security that it can jump start the bike if my battery fails when I stop at a waterfall 60 miles away from home. 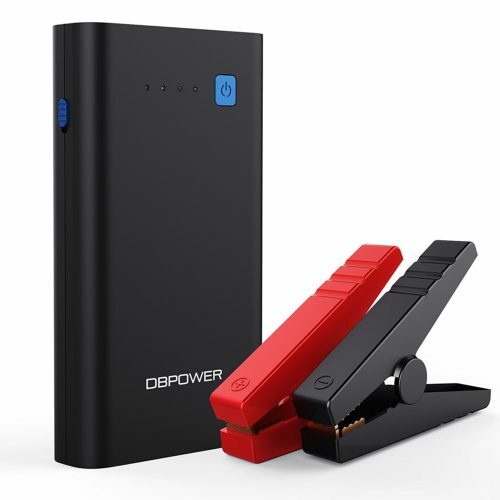 I wish it supported the Qualcomm Quick Charge 3.0 / motorola turbopower standard which could charge my phone a bit faster but it still provides enough juice for about two full charges while the phone is running. I haven’t had a chance to try it with any larger engines, but it jump starts my motorcycle and my nissan leaf (EV) just fine. I popped the cover open just to see what the insides look like– it looks like 3x lipo cells, size and weight indicates they’re probably 2660mah each. balance connectors, smart charging logic circuits, and some more jump starting logic/safety stuff inside the jumper cable connector. good stuff, this appears to be a safely designed product capable of delivering what it promises. I’d bought this a few months back and never really had the occasion to use it until the other day. I have a Jeep that had it’s battery drain out on me from lack of use. It had probably been over a month since I had last started it and it cranked over a couple times and then just clicks. This thing say it’s rated for up to 2.5L engines and the Jeep is a 4.0 but I figured I’d see what this thing really has got going for it and to my surprise the thing actually jumped the Jeep and quickly at that. Thing turned over fast and strong once I had it hooked up and fired right up. I’m impressed that a little guy like this about the size of a passport could jump a 4.0L engine but I’m not complaining. Edit: Bella sent me a replacement! She’s awesome! 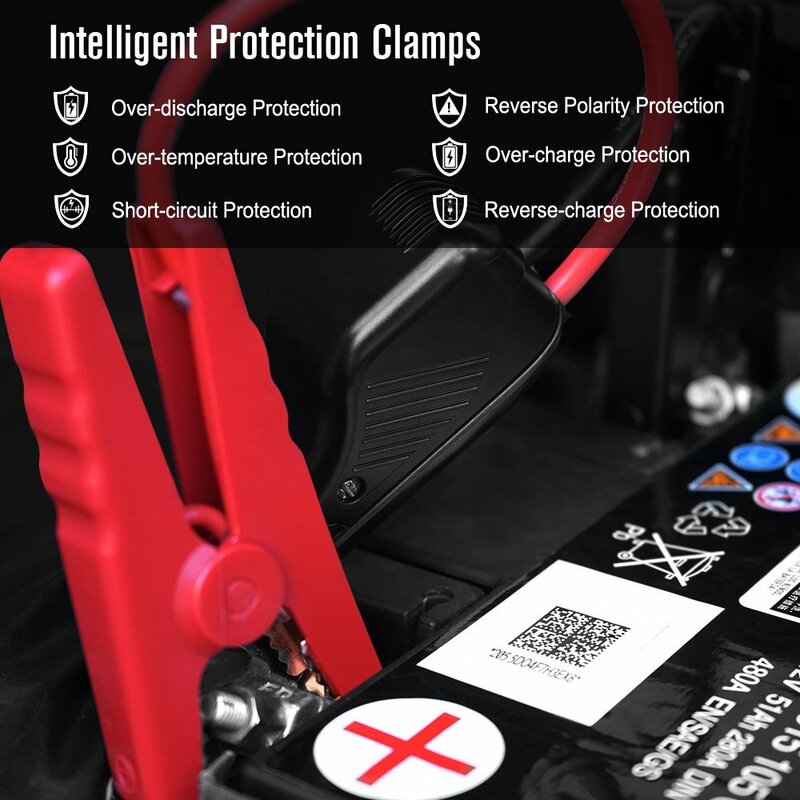 After two years of owning a jump starter from DBPOWER that I purchased in 2016 and only using it three times to jump start my car, it no longer holds charge. It is still under warranty for one more year, so I contacted DBPOWER and they are trying to avoid granting my warranty by making me perform unnecessary tasks so they can “debug” what the problem is. 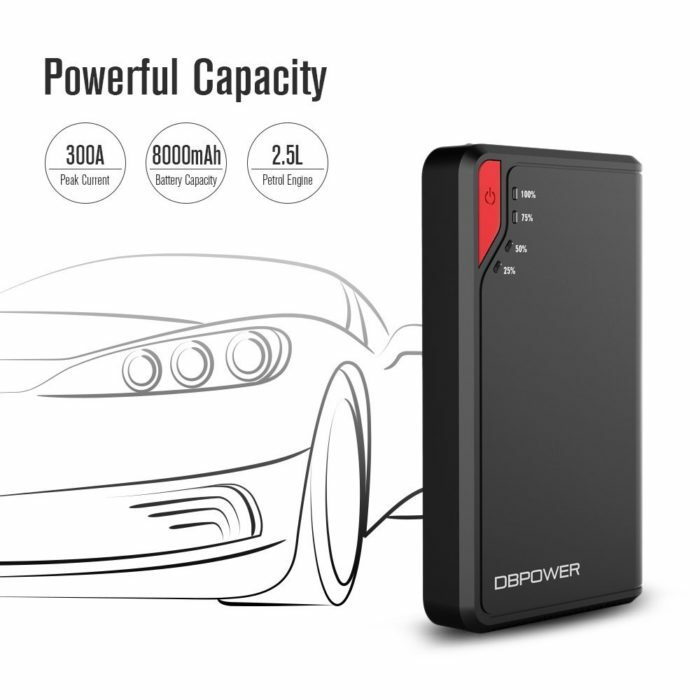 Justin, a representative from DBPower instructed me to “try different chargers” and to let the Jump Starter charge IN MY CAR WHILE DRIVING til it is fully charge which would take over 24 hours of driving (which I did on a trip to Vegas and back)! After that they want me to provide them with video footage to help them “debug further”. The customer support by DBPOWER is absolutely AWFUL! THEY WILL NOT GRANT YOUR WARRANTY and will make you spend so much time and effort that trying to RMA the item will cost you more than what you initially purchased it for. If you purchase this Jump Starter, expect to throw away $90 out the door because it stops holding charge after two years AND DBPOWER will NOT grant your warranty, instead they will try to stall as much as they can to AVOID granting the warranty. 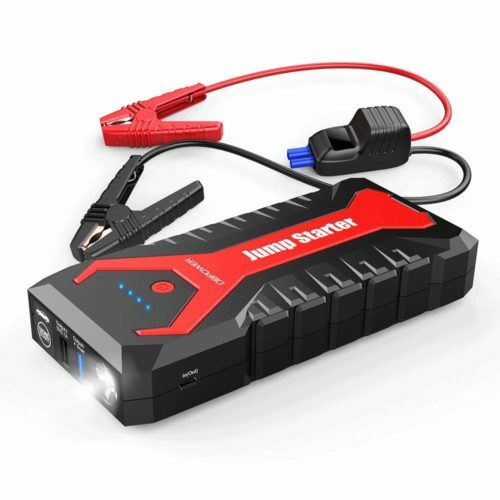 Here is the original listing for this same jump starter that I purchased: https://www.amazon.com/gp/product/B01D42U0VO/ref=oh_aui_detailpage_o00_s00?ie=UTF8&psc=1 DO NOT PURCHASE FROM DBPOWER! THEY WILL NOT GRANT YOUR WARRANTY! EDIT: Bella was kind enough to provide the best customer support and sent me a replacement. Out of all the other customer representatives out there, Bella was awesome! She was the only one that helped! 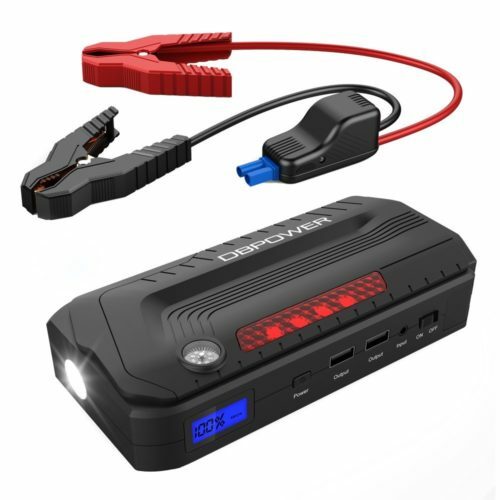 it work on car .if your battery is no more power.u dont need to find a other car to help u..it can make it …very nice .love it ..